Because it could be witness retaliation to threaten someone who has provided truthful testimony to the government. Appearing as an analyst on Brian Williams's MSNBC show, Former Federal Prosecutor Ellie Honig explained that retaliating against a witness be a federal offense. 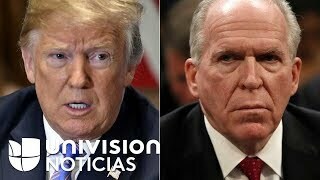 "The revocation of Brennan's security clearance is a new angle here, and I think the president is getting into even more dangerous ground," he said. "I think we're all familiar with the concept of obstruction of justice. But what I don't know that everybody understands is that it's also a crime to retaliate against someone who is a witness." Brennan is probably not a witness, Honig said, but someone like former FBI director James Comey certainly is a "crucial witness." "Its is a federal crime, -1513 if anyone wants to look it up, to retaliate against someone for providing truthful information to law enforcement," he said. "So he's getting closer and closer to really dangerous ground here. " The relevant section of the law is this. (e) Whoever knowingly, with the intent to retaliate, takes any action harmful to any person, including interference with the lawful employment or livelihood of any person, for providing to a law enforcement officer any truthful information relating to the commission or possible commission of any Federal offense, shall be fined under this title or imprisoned not more than 10 years, or both. (f) Whoever conspires to commit any offense under this section shall be subject to the same penalties as those prescribed for the offense the commission of which was the object of the conspiracy. As noted Brennan may not be a witness, but it's likely that Comey and McCabe would likely be witnesses on the obstruction of justice case while Bruce Ohr and Peter Strzok could be witnesses on the underlying intelligence and conspiracy investigation. Technically only Ohr probably still has a clearance, but that's really not the point -- the threat to harm their potential livelihood is the retaliation because even .it would be only minimally effective in some cases, it's clear that the White House thinks it would effective as punishment for what many of these people have said and most of that has been under oath, or likely to the Special Counsel. Let's just recall that Trump already said this to the WSJ. "I call it the rigged witch hunt, (it) is a sham," he told the WSJ. "And these people led it! " So I think it's something that had to be done." TPM: Is This Monica Goodling?